With many people, autumn is the most beautiful season of the year. And also, this is the best time to travel to the country of sunrise. 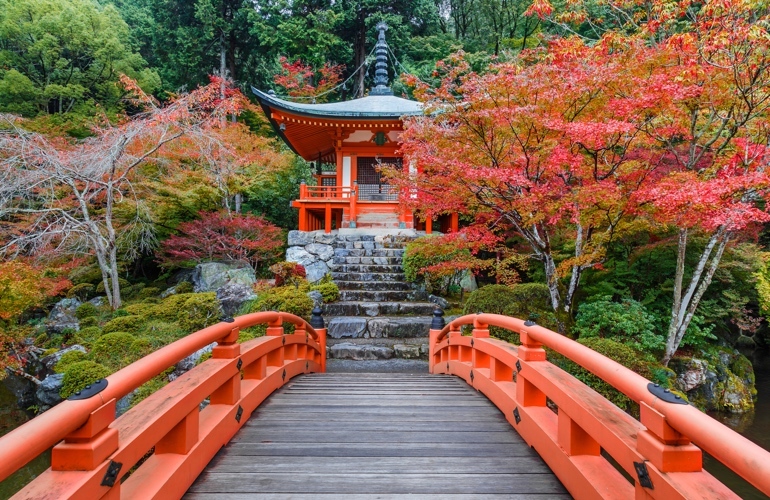 Getting to Japan in the fall will be one of your most valuable trips. 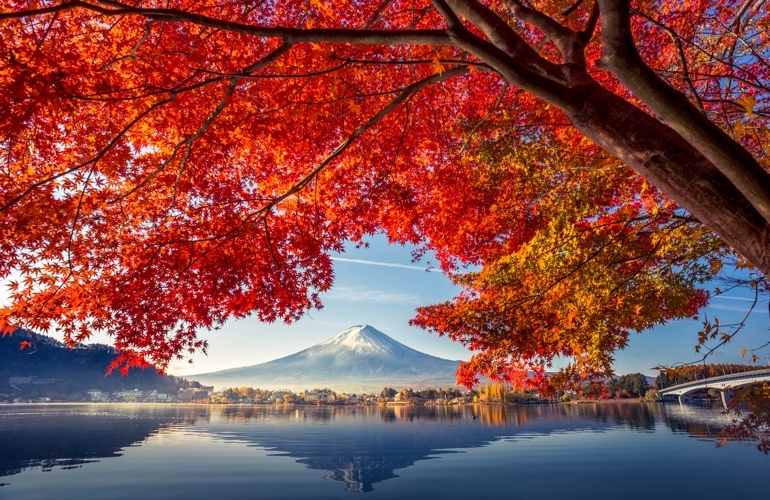 You will have the opportunity to see the most stunning moments of the year when the streets, parks, temples ... dye vibrant colors of maple leaves. So, do not forget the following places to admire the romantic and charming beauty of this autumn for your next adventure. Lake Tsuta Numa is the largest lake of the 7 Tsuta lakes. 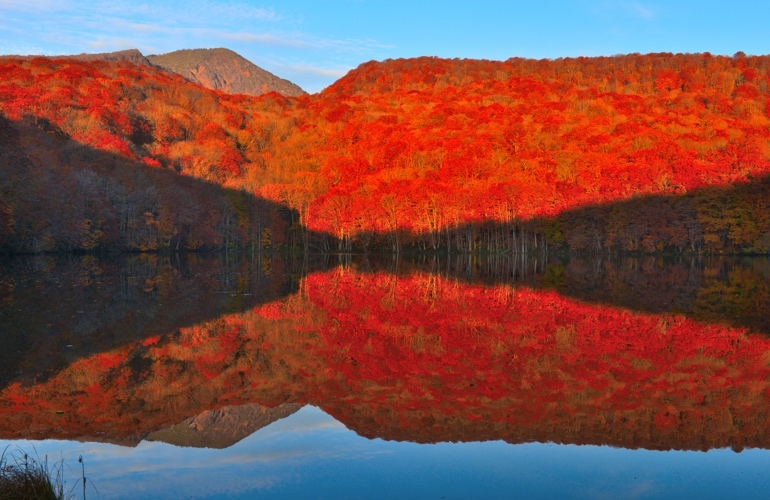 The lake is surrounded by vast primary forests, so in autumn, the brilliant red and yellow foliage reflect into the lake like thousands of fire. 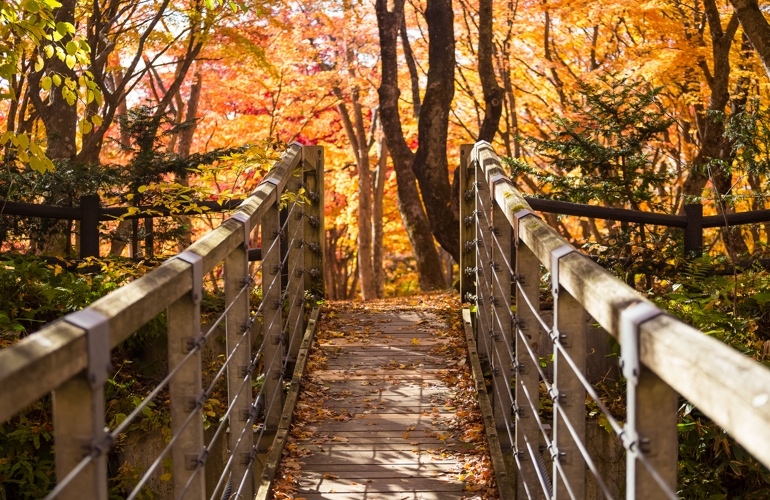 You can enjoy the glamorous autumn atmosphere here by taking a walk along the path parquet with tree-covered around the lake. In addition, this lake has become the symbol of the Tsuta forest and it is known to be home to different species of salmon, including red salmon. Located on the Pacific Ocean side of the Japanese coast, Hitachi Seaside Park is a combination of the unique natural environment of sand dunes, forests, grasslands, and springs. With a total space of 350 hectares, 200 hectares of which are open to the public, this huge spacious park is home to a variety of colorful flowers and grass throughout the four seasons. 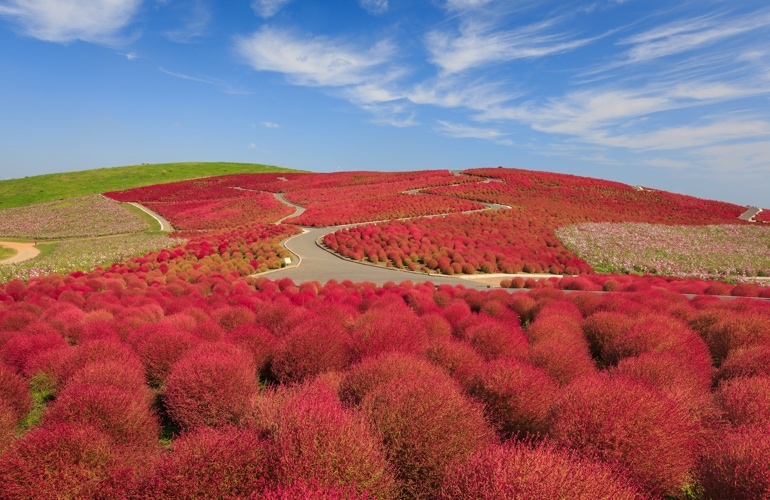 In special, in the autumn, you can enjoy the romantic scene of the blazing red field with 36000 bushes of Kochia. It will be an interesting experience that you will always remember in your life. Moreover, here you can totally be satisfied with numerous other attractions, including an amusement park, large grasslands, cycling activities, a forest athletics field, and so on. This is the most beautiful mountain temple in Japan. The Yamadera temple located in the city of Yamagata is considered to be the site of Tendai Buddhism in the northern region of Tohoku. To reach the top, you have to conquer 1015 stone steps in about 30 minutes. So you can explore the mysterious scenery along the way, and then the beautiful view down the valley with a graceful village. The temple complex was established in 860 A.D., including many other religious monuments such as shrines, gates, memorials, etc. It has been recognized as a historical and national monument. 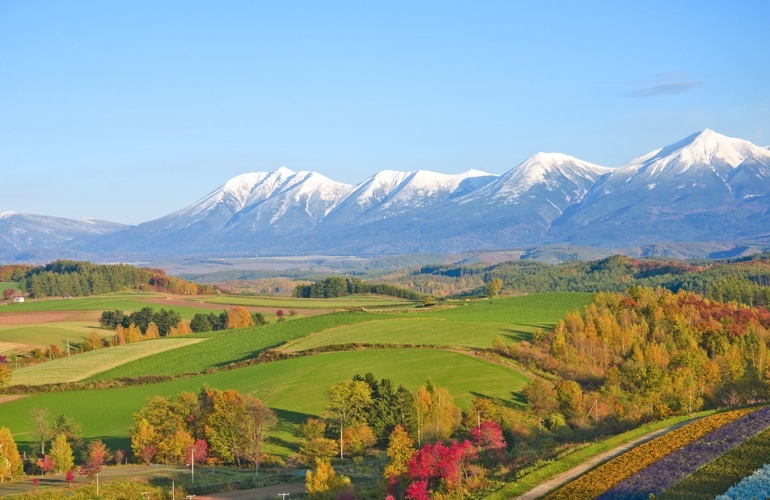 It is a 7-hectare park in Biei-Cho, Hokkaido. 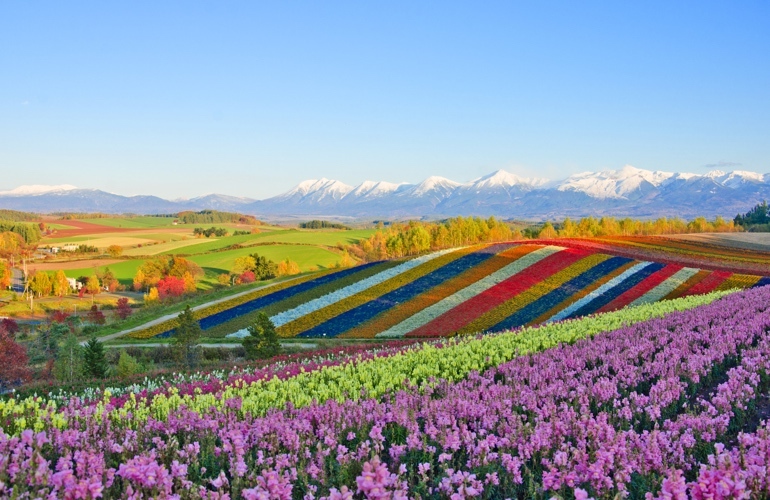 Shikisai flower garden consists of beautiful seasonal flowering hills, which are planted in the shape of the seven-colored rainbow. About 30 species of flowers such as lavender flowers, bean flowers, cosmos, and sunflowers bloom from spring to autumn. You will enjoy the scenery and pleasant floral scent. 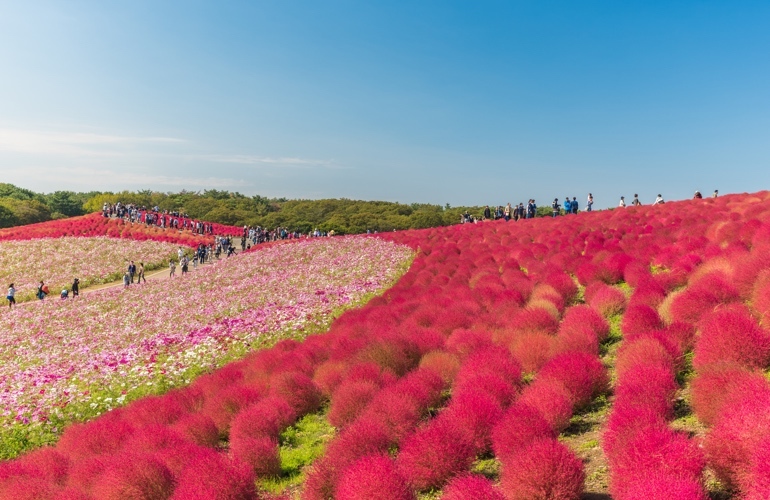 The impressive landscape of Shikisai no Oka can might surprises you because of the panoramic beauty of this flower garden. Built originally in 778, the temple is one of the oldest historical buildings in Japan. It was recognized by UNESCO as World Cultural Heritage in 1994. This temple has a beautiful scene with three waterfalls not only poetic but also very sacred. These three waterfalls symbolize the three greatest wishes of man is longevity, love, and success. If you take a sip from a waterfall, luck will come to you. But if you drink two or more, luck will reduce accordingly. 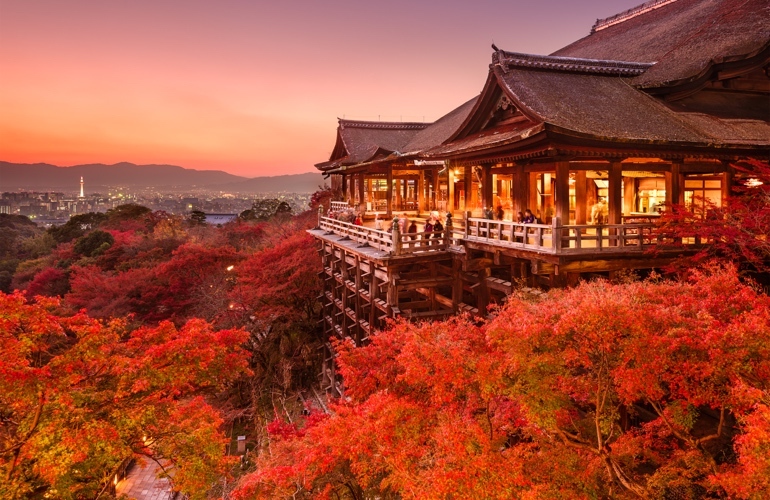 From the roof of the Kiyomizudera temple, you will have a wonderful view to see the entire city of Kyoto. 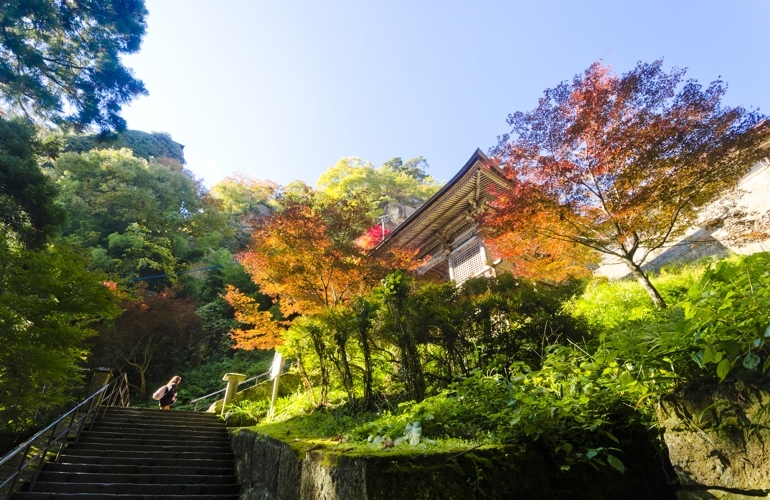 Each season brings different scenery to the temple, and autumn also has its own beauty full of charm. 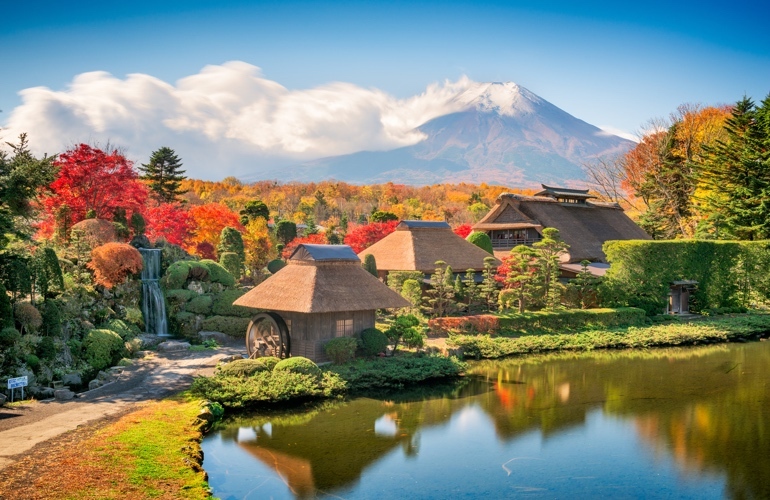 Mount Fuji is a destination that you can not miss this fall. 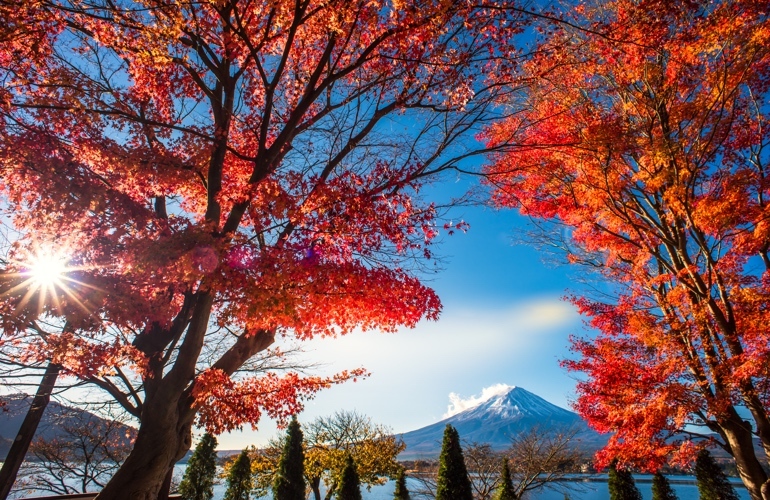 The brilliant color of maple leaves, ginkgo turns color from dark blue, bright yellow, blaze red to yellow-brown gradually to the height of this mountain of 3,776m height. Majestic and magnificent in any angle, it was recognized by UNESCO as the world cultural heritage in 2013. In particular, standing at the Kawaguchi Lake area, you can capture the whole panorama of Mount Fuji remotely perfectly. Located in the system of 5 lakes created by Fuji Volcano, Kawaguchi is the longest lake, second largest, and third deepest. Indeed, Mother nature has given Kawaguchi many charms landscapes. While coming here in the spring you can watch the cherries blossom, the summer flooded romantic flavor of lavender purple, and in the fall, you will admire the whole area in the red of maple leaves. Daigoji is a Buddhist temple in southeastern Kyoto. 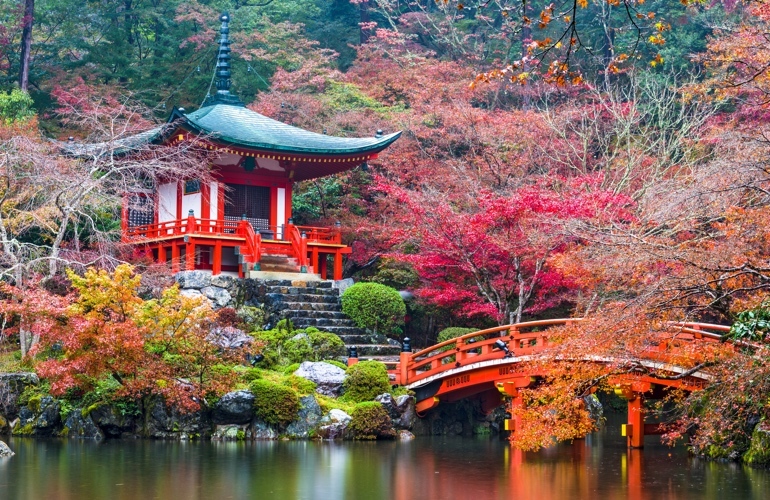 Discovered in 874, it was built with precious wood and surrounded by a beautiful cherry garden. This temple was recognized by UNESCO in 1994 as a world cultural heritage site called "cultural property of Kyoto ancient capital". 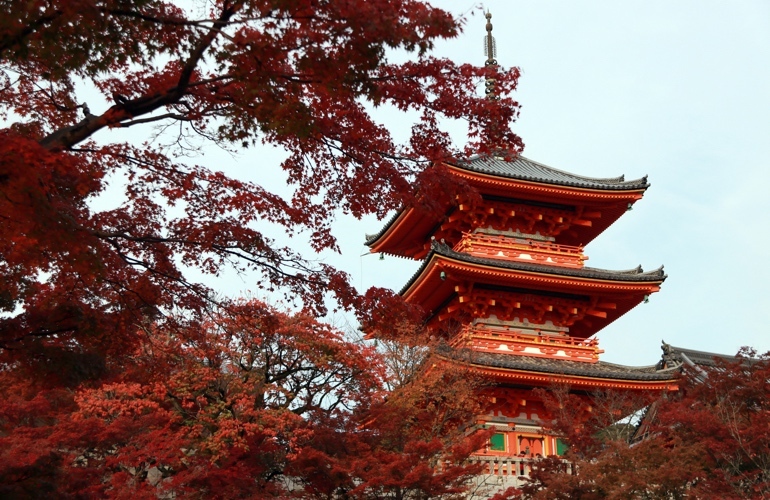 In the autumn when the ginkgo leaves turn red and yellow, the magnificent scenery of the Daigoji Temple makes you feel overwhelmed with the magnificent splendor of the captivating colors. Located at the foot of Phu Sy Mountain, Oshino Hakkai village is an interesting destination for those who want to explore the old way of life of the Japanese. Here, you will feel the beauty of peace, the color of the countryside emanating from the old traditional houses covered with ancient moss, the garden of green vegetables, the bonsai garden trimmed picky, the walls covered the dried corn until the wooden water wheel. 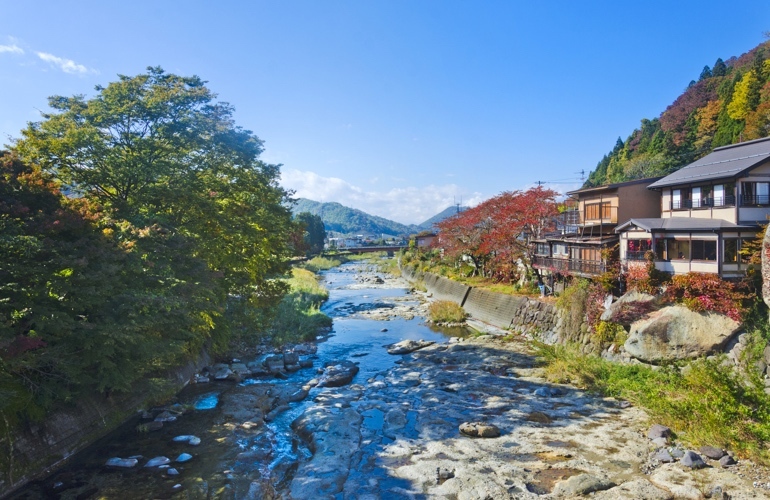 In the fall, the ancient village of Oshino Hakkai is surrounded by bright reds and yellowish of the maple leaves, as well as eight lush green lakes rich in minerals that are melted from Mount Fuji. 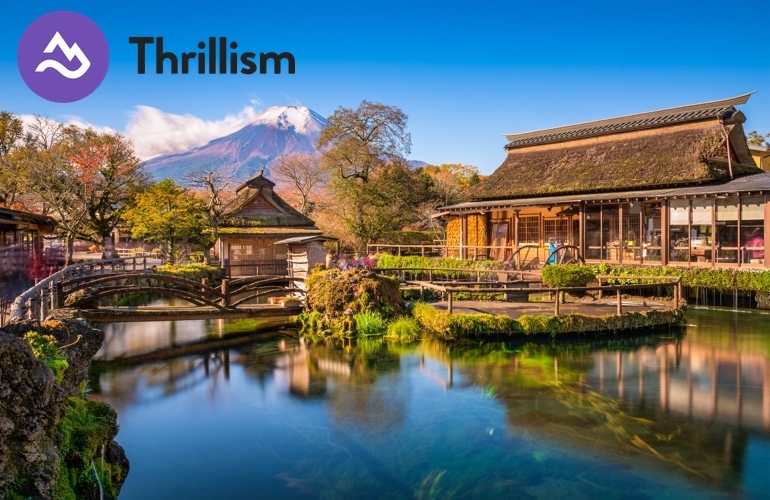 Find the next adventure you are looking for all over the world with Thrillism !